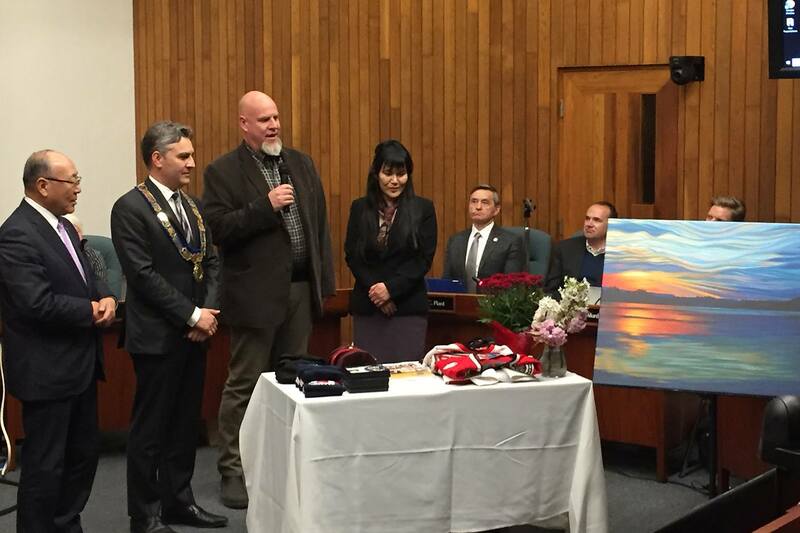 Tonight I attended the Saanich Council Meeting, where the Mayor Atwell of Saanich presented a print from my painting, Bear Hill at Sunset from Elk Lake, to Mayor Shinno of Hatsukaichi City of Japan. It was thrilling to be part of the ceremony, because it felt like a great honour, and because I’m not used to public speaking, and at one point Mayor Atwell handed me a microphone and asked me to say a few words about the painting. That, right there, is a thrill! I talked briefly about last summer, after forest fires swept British Columbia and Washington State, how a smokey haze rolled in and changed the light of day to an eerie greyish yellow. I painted this piece based on a photo I took at sunset on the first day we could see blue sky after the smoke that had lasted weeks started to dissipate. It was a relief to see it go. I felt like we could finally see in colour again. I was pleased to have the opportunity to thank Mayor Atwell in person for the political will in Saanich that has led to the Cedar Hill Arts Centre, where I use the open studio space to paint. It’s an amazing facility, and I’m very grateful to the municipality of Saanich for the opportunity to use it.